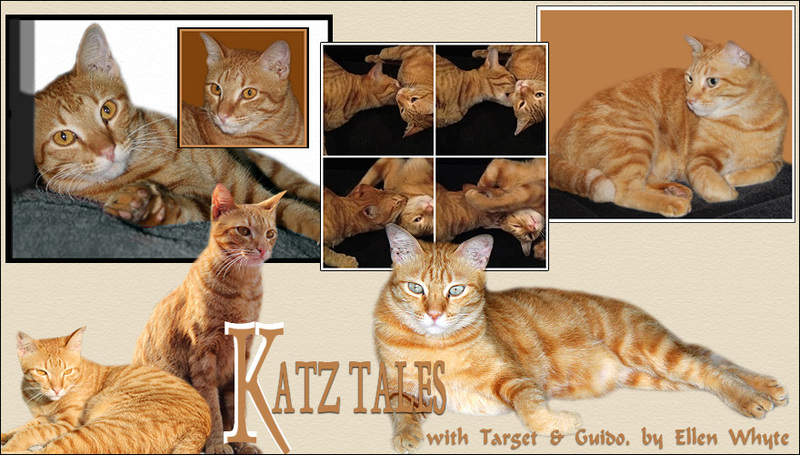 Katz And Other Tales: Happy New Year! Can't believe it's 2007 - whatever happened to 2006 and 2005? While we went out in the early evening of Hogmanae, I came back and enjoyed a quiet midnight at home with Scoop and Au. Neither particularly likes this time of year when crackers go off all over the place. Au is especially nervous and looks to Scoop to hold his paw for him. But they do enjoy the gourmet meals that come their way as part of the celebration! Scoop was looking a bit down when he realised his turkey has run out, and Au enjoyed the extra ham, so I've reminded them that Chinese New Year is coming up soon, which means they can expect roast pork and prawns to be on the menu soon. It's done the trick and they're smiling again. Here they are, with Scoop doing the Big Brother thing and giving Au a friendly lick on the ear. prawns? turkey? chicken? I want to live with you guys!! !